One of the most interesting places for headsets is inside the $300 range. Outside of gaming headsets, about $300 is enough for entry-level audiophile headphones. You’d probably need to tack on another $100 for an amplifier, and you’d lose almost every type of headphone feature you can name in exchange for sound quality. But the point is you’re quite close to excellence, and that’s about what you should expect. Among gaming headsets, the $300 range puts you within reach of almost every top-shelf headset on the market. Of course, without knowing exactly what you’re getting, it’s easy to end up paying for features you don’t need or want. It all comes down to detail. The Victrix Pro AF Gaming Headset is a mystery. 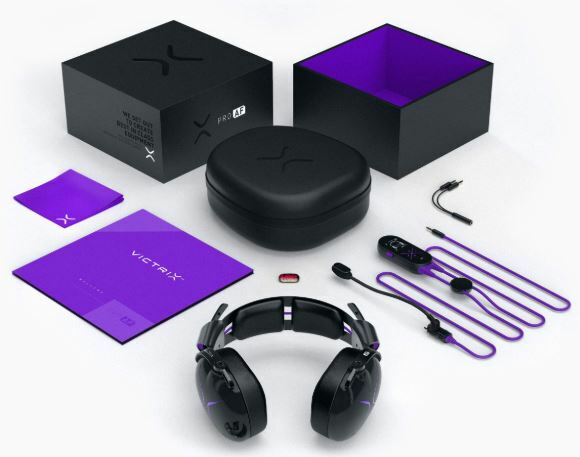 Who did Victrix make this headset for? It’s not immediately obvious. Moving from one part of this headset to the next, each portion holds up pretty well to close scrutiny. However, it’s totally not clear if this is a specialized headset for a specific type of gamer, or if it’s a general gaming headset aimed at the average person. People want their high-end stuff look and feel high-end. 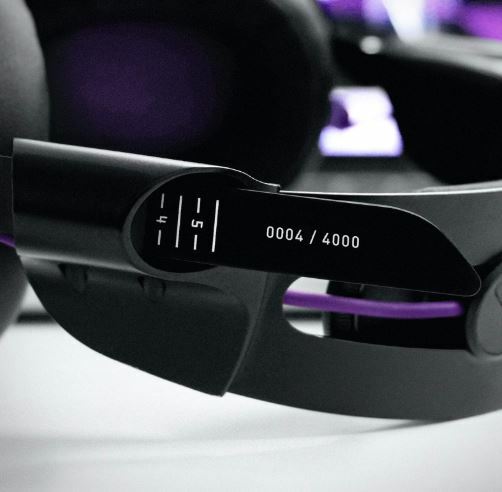 The Victrix Pro AF Xbox One Wired Gaming Headset certainly checks off that requirement. The black aluminum frame is curvy and sleek, giving off the unmistakable impression of a premium grade headset. Largely made of aluminum, some key points made of stainless steel, and others a lightweight polycarbonate. Along each ear cup, purple LEDs are placed in wide U-shaped lines. The purple highlighting continues on with its connecting cords, running down from the headband. They also provide some wiggle-room for people who are looking for a gaming headset that’s a little more mainstream looking. If the LEDs aren’t your style, you can flip them off, leaving only the glossy black exterior. 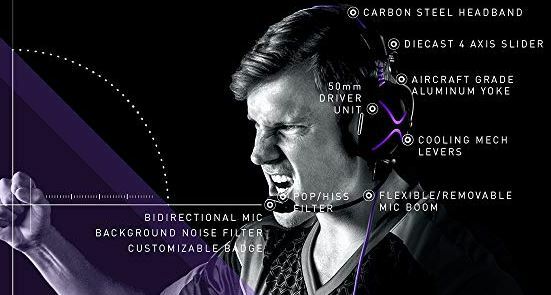 Inside the exterior, the Victrix Pro AF Gaming Headset is constructed with fairly large 50mm audio drivers. That’s about 20% larger than many comparable over-ear headphones, which has a fairly drastic impact on several other points of design. For example, it allows for greater bass response, more tonal clarity, and higher volume. The seemingly slight size difference even has a small impact on comfort, as we’ll see later. The base of each ear-cup can be swiveled in roughly a 180-degree radius, helping to accommodate different head sizes. Though the contributions of swiveling to comfort tend to be fairly small, it contributes greatly to storage, portability, and ultimately the durability of this headset. It allows the Victrix Pro AF to be folded flat and tucked away on a shelf, or shoved into a bag without having to be concerned about a little motion damaging them. With respect to sound quality, those larger drivers are what allow for rich environmental details to be present. Everything comes through with considerable clarity, making the Pro AF an optimal selection for games where you’ve got to use sound to get the drop on your opponent. But the sound isn’t simply tactical in nature. The Pro AF also delivers with respect to creating a cinematic soundscape, helping you hear banging on the ground, the impact of slicing swords, and other immersive audio cues as you explore new environments. Over-ear headphones are almost comfortable by default, which is why high-end models like the Pro AF are outright pleasant to wear. The Victrix Pro AF is constructed with slow-return memory foam, further covered in faux-leather, and then pressed snugly against the head. Their 11-ounce weight is a little bit on the hefty side among headsets generally, but on the lighter side among gaming headsets specifically. All in all, that 11-ounce weight isn’t totally invisible, but it’s quite unlikely to bother you during extended use. With respect to adjustability, the Pro AF can be raised or lowered by up to five inches in either direction. Their adjustment bar uses a metallic construction to smoothly transition from one place to the next, making for easy adjustment. Along the top of the headband there’s a lever that looks a bit like a small flagpole sticking up from the left ear-cup. The flag-poles are actually mechanical levers to help open up the ear-cup vents. 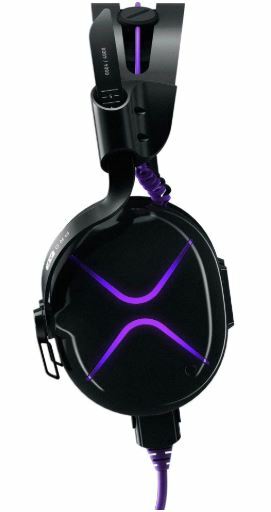 It’s a design which helps let air-in without greatly compromising the noise isolation provided by the Victrix Pro AF Wired Gaming Headset. In other words, this headset uses its own built-in cooling system. It’s one of two headsets on the market to have its own cooling mechanism, and the only one to use this design. 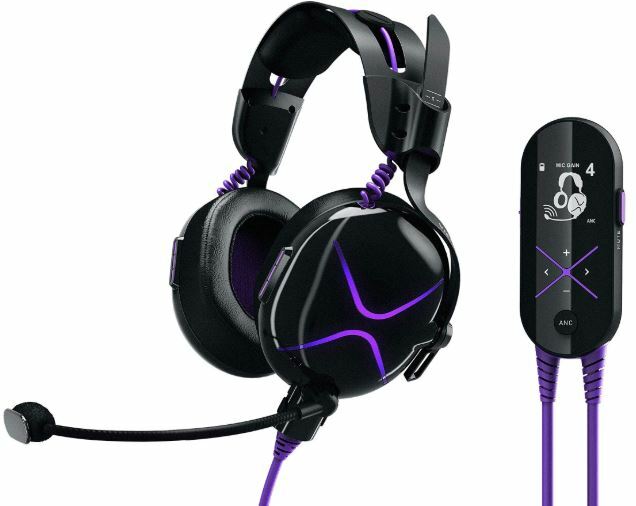 Almost just as unique, the Victrix Pro AF Wired Gaming Headset uses an in-line controller to help adjust your headset. It shares the same aesthetic as the Pro AF, but it’s ultimately a small battery-powered box with a LCD display and four directional buttons. The display provides you with information about your mic gain settings, as well as allows you to make on-the-fly adjustments to any number of aspects of the Pro AF Wired Gaming Headset. You can adjust the ear cup lighting to make it dimmer, brighter, or even turn it off. It’s here you can initiate multiple microphone monitoring to hear yourself talk; a great feature anytime you’re wondering if your microphone is coming through too loudly or too softly. Less exciting but just as useful, you can adjust the volume up and down. And there are even a pair of preset sound profiles you can switch between. The first setting is a cinematic soundscape that’s somewhat balanced. The second is a boosted bass mode. Whether you’ll appreciate either adjustment is ultimately a matter of taste, but the extra bass does come through admirably with these slightly larger 50mm drivers. You may notice a micro USB port on the box, but it’s only used for firmware updates, not for charging. Instead of a lithium-ion rechargeable battery, the Victrix Pro AF Wired Gaming Headset requires you use two AA batteries. The headset includes four, and the controller gets 20 hours of battery life a pair of good batteries in place. On one hand, it would’ve been nice to have a rechargeable battery inside the in-line controller box. On the other hand, those batteries fall apart within a few years of regular use, so being able to swap in AA batteries is a far more lasting solution. The final button on the in-line panel is the ANC button. For whatever reason, ANC has never been a part of gaming gear until quite recently. It could be because many gamers simply do not know what ANC actually does, or because it’s not universal to the needs of gamers. ANC technology is exceptionally good at protecting your ears from bass tones. But it’s not very good at handling mid-tones, which is where most of the human voice tends to be. And it does very little to wipe out exceptionally high tones, like having a tiny dog with a shrill bark sitting next to you. For some types of environments, ANC is great. For other environments, it’s something you could take or leave. The Pro AF has highly competent ANC, but like all ANC, it does chew through battery power. Like any top-shelf gaming headset ought to, the Pro AF uses four dedicated microphones to listen to its surrounding environment. The outward mic is a bidirectional electret microphone, with a forward-facing noise shield. And the outward-facing portion of that shield uses a swappable faceplate, similar to the gear used by professional e-sports teams. That allows you to put your own customized faceplate logo on the front of the headset, a useful feature for people who want to customize their gear further. The boom mic was originally designed for an unpressurized Cobra attack helicopter. Suffice to say, it can handle a loud LAN party. But there’s a reason why you don’t put helicopter mics in headsets. The microphone boom is sensitive to a fault; it will definitely pick up background noise. Yes, it’s exceptionally good at making sure your voice gets through. But it’s not fine-tuned for squeezing out moderate amounts of ambient noise in your environment. Your voice will come through over the roar of an engine or not, but so will the sound of your PC fans, friends, and so on. Its clarity is good for communication, but you wouldn’t want to use this microphone it makes studio recordings for your next mix-tape. One thing you may or may not like. The microphone is permanently connected to the headset’s wiring. While not in use, you can flip it upward and forget about it pretty easily. But if you want to remove it entirely, you’ve got to unplug the headset. With the control box powered off, the headset still works in analogue mode. But you can’t turn on the ANC, customize the microphone, or affect the sound modes. The Pro AF includes a hard-shell carrying case. It snugly golds onto the PRO AF, leaving only enough room for its cabling inside the case. It includes a 3-foot extension cable and a PC splitter cable. The splitter has its own dedicated mic and headphone jacks. And it includes a line clip, helping you attach the in-line controls to your clothing, or otherwise nearby. Who Should Choose the Victrix Pro AF Wired Gaming Headset? The Pro AF is an excellent choice for someone who’s experienced heat issues with their headset. It ought to be of special interest of anyone who lives in a warmer climate. Outside of heat, it has among the first ANC feature offered on any gaming headset, which makes it a good choice for someone who’s got a louder PC or A/C unit. The microphone is a mixed bag. It’s not a studio-quality microphone intended for recording things, but it does provide clear communication that digital lives can depend on. 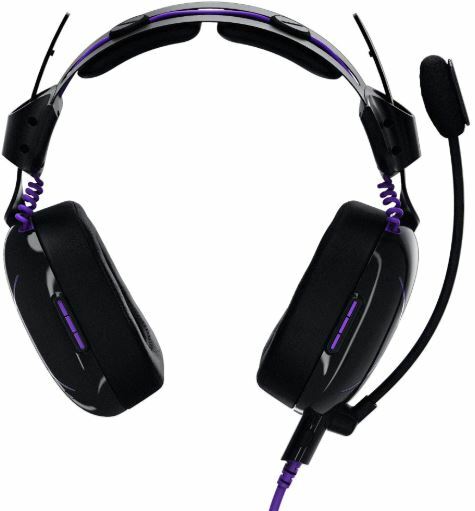 And the Victrix Pro AF Wired Gaming Headset is a good choice for someone who values style. It looks cool whether you’ve got the LEDs on or otherwise. All in all, this headset is exactly what most gamers want from their headset. It delivers on immersion, comfort, and practical tactical information all at once.